There is no shortage of good reasons to oppose the proposed amendment to North Carolina’s constitution that would ban gay marriage in the state. There’s the matter, for instance, of its inherent bigotry, not to mention its essential redundancy (the state already banned gay marriage in 1996.) But in the run-up to the decisive May 8 vote, a burgeoning grassroots movement in North Carolina is offering an entirely different justification for opposing Amendment One. Rather than pointing to the blatant harm the amendment would inflict on homosexual residents of the state, they are highlighting the unintended consequences it will have for heterosexuals. The root of the problem that Eichner foresees—and that she publicized in a 27-page legal analysis, and repurposed into op-eds, slideshows, and Cliff Note-style summaries—is that the amendment diverges from the language used in existing North Carolina marriage laws. The ban on gay marriage that passed in 1996, the Marriage Protection Act, was very specific in how it defined marriage: “Marriages, whether created by common law, contracted, or performed outside of North Carolina, between individuals of the same gender are not valid in North Carolina.” That reserved the possibility of legal recognition for heterosexual couples who weren’t technically married. Amendment One by contrast uses an ambiguous term—“domestic legal unions”—that was intended to block the way for civil unions and domestic partnerships for homosexual couples. 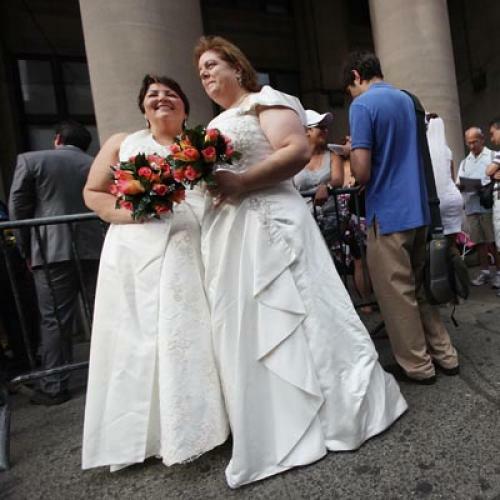 But it may also inadvertently rescind the legal status already granted to non-married couples who live together. As a result, the state may be forced to put a halt to the growing number of protections—ranging from domestic violence protections to children’s health insurance—that it currently offers to non-married couples, homosexual and heterosexual alike. By Eichner’s count, the rights of the over 185,000 straight, cohabitating couples in North Carolina would be put in jeopardy; ninety-one percent of the couples that would be affected, she claims, are heterosexual. She’s careful to note that rights for non-married couples wouldn’t immediately be rescinded wholesale if the amendment is passed. But as Eichner put it in her November paper, the amendment’s phrasing “has never been used in any statutory law in North Carolina or interpreted by our courts, and which has never been interpreted by courts in any other state.” At the least, the amendment seems guaranteed to set off a furious set of court battles over its scope. Indeed, Eichner points out that this is exactly what happened in the state of Ohio. That state passed an amendment containing similarly broad language in 2004, and has spent years working to define how existing laws were affected. According to her paper, “seven Ohio state trial courts and two appellate courts, in at least 27 cases … [held] its state’s domestic violence statute unconstitutional insofar it protected unmarried cohabitants,” despite the fact that Ohio’s ban on any status “that intends to approximate the design, qualities, significance or effect of marriage,” is decidedly more direct. Still, it took almost three years before the Ohio Supreme Court resolved the issue, deciding to keep the laws intact. Jeremy Kennedy, the campaign manager for the coalition Protect North Carolina Families, which opposes the amendment, quoted Eichner’s Ohio example in our conversation about the legislation, making it clear that he saw this as the most savvy way to rally opposition to the amendment. “We needed to let people who were in the middle know that there were going to be consequences,” he told me. The amendment’s allegedly flawed phrasing appears to have originally received little scrutiny by the legislature because it was approved in apparent haste. A version of the amendment was proposed in the State House and Senate in a special session in September, and passed through both houses in less than two days. “Some of us—interested law professors—still found out and went to the House committee,” remembers Eichner. “And after we got there, they decided that there would be no public hearing on this issue.” As such, North Carolina’s legislators agreed to curtail the rights of its citizens in ways that most of them never understood. But the campaign against the amendment has been bolstered by the fact that some of its authors themselves now harbor regrets about it. Even the amendment’s Democratic sponsor in the House, Jim Crawford, has renounced it, on the grounds that it may foreclose the possibility of offering homosexual couples any legal protections at all. “I think it’s only right for these folks to have a contract or an agreement so that they can look after each other in the hospital, have insurance, and the other benefits,” he told his constituents at a public forum on the amendment. “When this legislation was introduced it did not have the contract problems that this bill has now. … I’m sorry that this got changed with my name on it.” Chris Fitzsimon, who runs a blog called NC Policywatch, told me that even though conservatives in the state had been pushing for such an amendment for over a decade, the new revelations about its effects have made some of them uncomfortable. Indeed, Republican House Speaker Thom Tillis recently let slip that, even if the amendment were to pass, he expected it to be repealed in 20 years. But Eichner is hoping that by appealing to heterosexuals’ self-interest, rather than simply their empathy, Tillis's timetable can be considerably sped up. Thomas Stackpole is a reporter-researcher at The New Republic. Correction: An earlier version of this article mistakenly referred to the House Speaker of North Carolina as Thom Tiller, rather than Thom Tillis. We regret the error.